(Last Updated : 31.01.19). KVS Interview Letter 2019 Teacher Interview Dates : Download KVS PGT, TGT, PRT Interview Letter & Schedule 2019 - Kendriya Vidyala Sangathan (KVS) released interview dates and interview letter for teacher interview 2019 for Primary Teacher, TGT, PGT, Principal & Vice-Principal Recruitment 2018-19. The candidates who have shortlisted for these posts can download their interview admit card from the official website of KVS i.e. www.kvsangathan.nic.in or http://cbseitms.nic.in/kvs_static/home.html as per the schedule. The written test result has been declared for PRT, TGT, PGT, Vice-Principal & Principal against PRT, TGT & PGT Recruitment Advt. No. 14/2018. Check here latest updates on Primary Teacher, Trained Graduate Teacher and Post Graduate Teacher Recruitment 2018-19. Download here KVS Interview Hall Ticket 2019 Interview Schedule for Principal, PGT, TGT & PRT Teacher Interview Letter. The Sangathan will conduct interview for the post of PRT, TGT, PGT in February 2019. Here is interview admit card, interview schedule and other details. 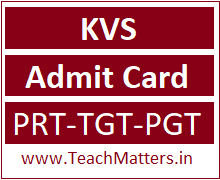 KVS Teacher Interview Admit Card for the post of PRT, TGT & PGT can be downloaded from the official website of KVS as per the schedule. Submit your 'Registration No.' & Date of Birth. Download and Print the Interview Letter. Note : You can also visit direct website of KVS Recruitment 2018 i.e. www./cbseitms.nic.in/kvs_static/home.html to download interview admit card.